Regular visitors here might be aware of the ongoing cookie challenge between me and Susan at Organized 31. It started innocently enough when Susan posted a yummy recipe for chocolate chip cookies with an Oreo hidden inside. Inspired by this “surprise” concept, I experimented with a variety of doughs and candy combinations and came up with my Peanut Butter Cup Chocolate Cookies. Then came Thin Mint Surprise Cookies at Organized 31, which were answered with Snickers Surprise Cookies here on Wondermom Wannabe. Last week, the challenge was volleyed back to me when Susan posted a recipe for Rolo Pretzel Surprise Cookies. In response, I decided to create a cookie based on my favorite candy bar — Almond Joy. And yes, though it’s not apparent from the picture, there is an Almond Joy hidden in the center of this cookie. For this cookie, I reinvented the pudding mix cookie recipe and used coconut creme flavored pudding. I had to cut the Almond Joy sections in half to fit inside the dough balls (I used a medium cookie scoop). Also, I thought the chocolate drizzle made for a prettier cookie, but if you want to skip that step you can just add chocolate chips to the dough before baking instead. In a large bowl, beat together butter and sugars until well blended. Add pudding mix and mix well. Add the eggs and vanilla and mix well again. Gradually add flour mixture. Continue to mix on low speed and add baking soda. Cut Almond Joy bars in half. Scoop dough using a medium cookie scoop or a large spoon and push one half of an Almond Joy candy bar into the center of the ball. Arrange cookie dough balls on an ungreased cookie sheet 2-inches apart. Bake at 350° for 10-12 minutes. Let cool for 1-2 minutes and remove to cooling rack. While cookies are cooling, melt 4 T butter and chocolate chips in a small saucepan over low heat. Drizzle chocolate over cookies and sprinkle coconut on top before chocolate sets. Susan, you are a hero in my kids’ eyes because you encouraged me to stray from my typical healthy recipes AND because it usually takes me 2-3 practice batches before I get the recipe just right. So, they’ve voted that we continue our baking competition. However, they’ve requested that we expand it to include other desserts. How do you feel about tackling brownies? I’ll be watching your site next week to see what you come up with. You and Susan have been making some terrific cookies. I really like Almond Joy bars, so these are right up my alley. I’m stopping by from the Let’s Get Real Friday Link Party. Thanks so much for joining us this week. These look better than Almond Joy candy bars for sure! Thanks for linking up to our Ladies Only Blog Share Link Party. You have been creating some pretty great cookies! I am not sure which are my favorites, but I think these may be. 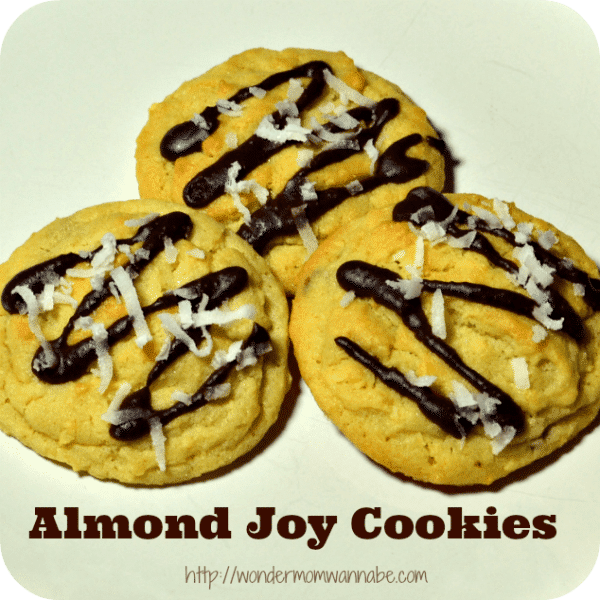 I love Almond Joys and who wouldn’t love them in a cookie? Oh man those look amazing! Corinne, you say “hero” but really you think “bad influence.” 🙂 My kids are enjoying this friendly challenge, too. 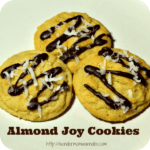 You’ve sunk my resolution to eat healthier in March (unless I quick make a batch of these almond joy cookies and eat them before the end of the month!). Hmm. brownies, huh? Okay. Let’s see what I can come up with (after I make a batch of these cookies).